Sweet corn calories are healthiest form of calories you can consume. Due to this, the health benefits of sweet corn are tremendous and a diet rich in sweet corn is often prescribed for those who suffer from heart diseases and cancer.For these various reasons, the consumption of sweet corn is very necessary, as it has so many health benefits. It is a good idea to include sweet corn as a staple part of your diet to a considerable extent so as to maximise the benefits that you can glean from this rich food source. A moderate consumption of sweet corn may help children with increasing brainpower and memory. This is because thiamine (a component of Vitamin B) helps promote increased memory. Recent research has focused on sweet corn and its antioxidant properties. Sweet corn antioxidants can prevent cardiovascular problems and fight cancer. 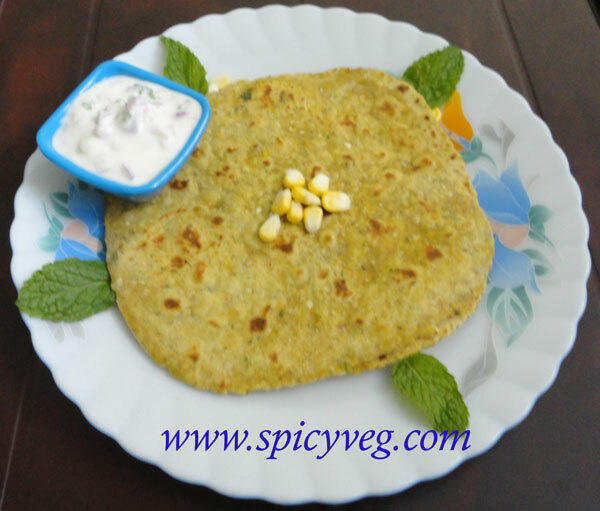 Sweet corn entry into the Indian markets has added more scope to the Indian cuisine.Here is delicious paratha with the goodness of sweet corn ,mint and a hint of spice with chillies these parathas are delicious accompaniment to any curry ,raita or just with the plain curd. Oil to fry the paratha. 1.Grind the corn, green chillies and mint into a coarse paste and add salt to the paste . Set aside. 2.In a mixing bowl, combine the corn paste, wheat flour and knead into a smooth dough. Divide the dough into small balls and set aside. 3.Roll out each ball into a circle, using wheat flour for dusting. 4.Put the roti on a hot pan, cook for a minute. Add a little oil around the edges, turn and fry the other side. Take it out. 5.Serve hot with onion raita.